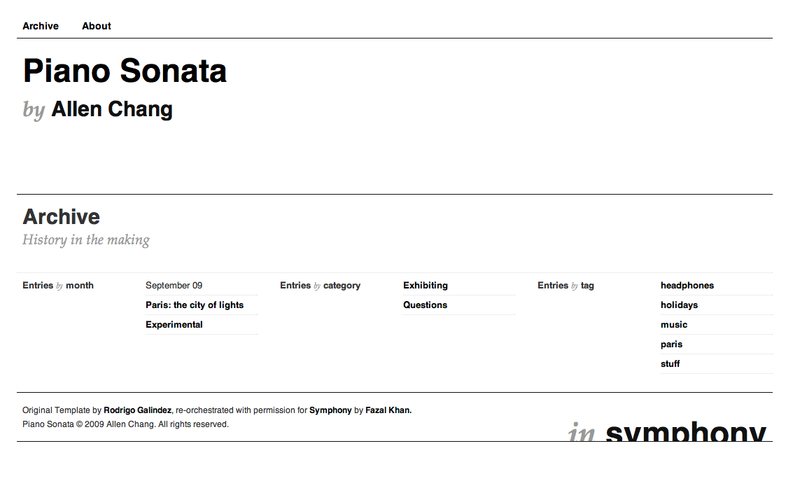 “Piano Sonata” – Ensembles – Download – Symphony. 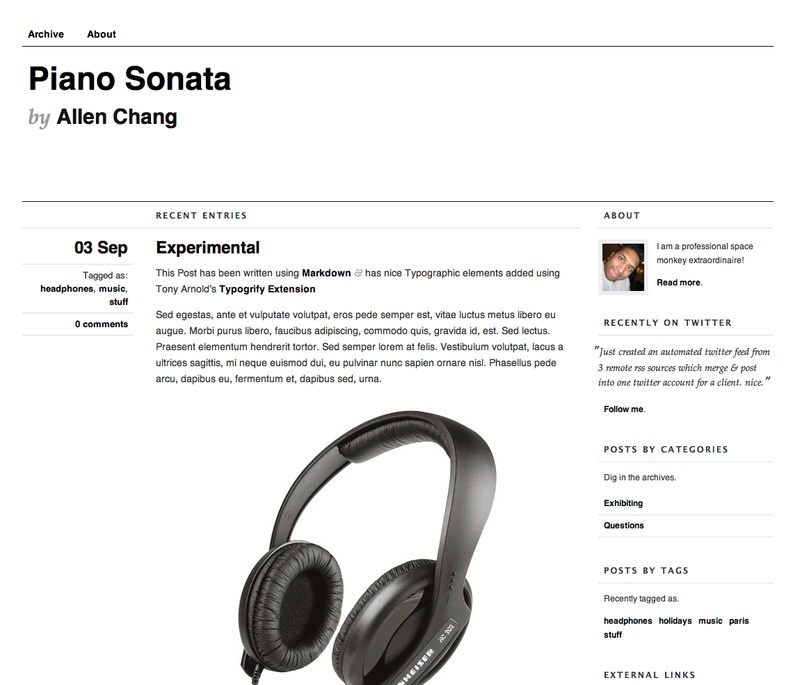 Piano Sonata is a blog ensemble. It is currently in beta pending input from you, the wider community. The intention is to eventually replace Spectrum as the default Symphony ensemble. I’m going to take this opportunity to give you some background information on this ensemble, the scope of work and also the future of it. This ensemble is based upon a competition entry from my friend Rodrigo Galindez which he submitted to Smashing Magazine. It came in third place and has since done the rounds on many CSS gallery sites for it’s clean design and layout. I asked Rodrigo to let me build an ensemble for Symphony and he kindly agreed. The theme is designed to highlight some of Symphony’s strengths and features. It should be able to work in it’s own right, and also allow developers to hack and play around with it and make it there own. The ensemble uses some Symphony extensions, but shouldn’t need to rely on a whole raft of them. The XSL should be accessible and allow newbies and experts alike to approach it. The ensemble comes with some extensions installed, however I haven’t used them all (such as static section), and as such will be removed from the final release. Please download the ensemble, play with it and suggest any improvements, features or fixes you would like to see happen. My initial thoughts are to add a photos page, to highlight the remote DS aspect and combine this with JIT. The ensemble uses this to some degree with the twitter integration but I think flickr/picasa integration may be something that could prove beneficial.